The Cavision 4 x 5.65" Soft Mist Black 1/8 Filter can be applied to purposely reduce sharpness and soften highlights. This can be useful for reducing the appearance of glare on a subject while creating a general soft-focus effect. When applied to digital cinematography or digital photography, the soft-focus effect provides results that emulate the appearance of recording with the grain structure and emulsion of film. Additionally, as highlights within a frame are diffused, ambient illumination is distributed to darker areas within the exposure, helping to balance the tonal range among highlights and shadows. 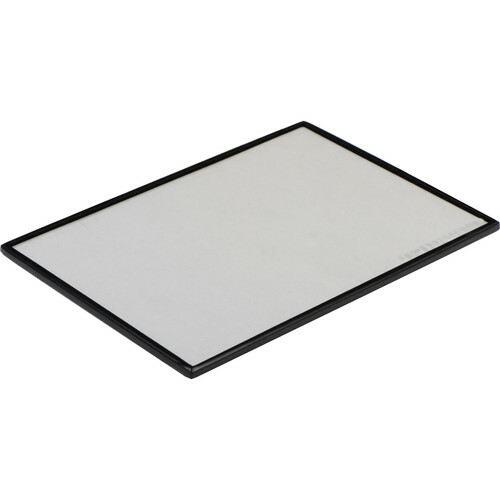 This filter constructed from glass, is compatible with filter holders that can accommodate 4mm-thick rectangular filters, and has a grade of 1/8. Grades of 1/4 or 1/2 are also available where this filter type's effect becomes approximately twice as strong with each grade number increase. Box Dimensions (LxWxH) 7.0 x 5.5 x 0.5"